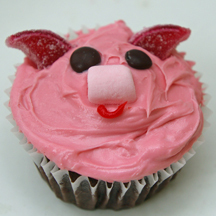 For a fun various on pig cupcakes, try this version with a ring in its nose. What You Need: 1 cupcake; frosting tinted pink; red mini sugar-coated fruit slice, cut in half; mini pink marshmallow; 2 brown mini M&Ms; red gel or tube icing with round tip. How to Make It: Frost cupcake pink. Add ears, eyes and nose as shown. Using gel or tube icing, draw U-shape under nose for nose ring. This entry was posted on Saturday, June 14th, 2008 at 8:19 am	and is filed under animal cupcakes. You can follow any responses to this entry through the RSS 2.0 feed. Responses are currently closed, but you can trackback from your own site.